Axilum Robotics TMS-Robot is the first robot developed specifically to assist researchers and health care professionals for the positioning of a Transcranial Magnetic Stimulation coil. It includes a 7 degree-of-freedom robotic arm and a 2 degree-of-freedom, computer-controlled patient seat. 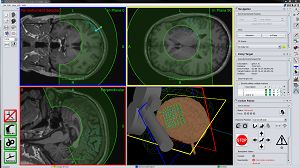 Axilum Robotics TMS-Robot, in combination with a compatible neuronavigation system and a compatible coil connected to its own stimulator, allows the automatic execution of an image guided TMS session planned in advance. Once the stimulation targets and coil self-rotation have been defined in the neuronavigation system, Axilum Robotics TMS-Robot positions the coil tangentially at these targets, ensures contact between coil and head, and compensates for any head movements during the session, keeping the coil position and orientation with respect to the brain. The original, patented, hemispherical architecture of the robotic arm allows the positioning of the coil’s stimulation hot spot around a hemisphere. This architecture enables access to all stimulation areas while the head is located inside the work hemisphere. The computer-controlled patient seat facilitates the adjustment of the patient head inside the workspace. Axilum Robotics TMS-Robot offers improved accuracy. The robotic arm and the patient seat include 9 high-precision position sensors that allow to measure and repeat any desired configuration of the coil with respect to the brain. Orientate the coil when applied on the head surface to reach the desired internal structures. Control the self-rotation of the coil to define the direction of the induced electric field. This provides a way to control precisely the stimulation entry point and the stimulated internal structures. The neuronavigation system monitors the coil position and orientation in real time to compensate for any movement of the head measured by its 3D optical tracking system during the stimulation. A flat force sensor that is non-sensitive to the magnetic field is affixed on the inferior surface of the TMS coil to measure the contact between the coil and the head. The robot’s embedded software controls the applied force in real time so that it does not exceed the coil’s own weight. Therefore, stimulations can be delivered only when the coil is touching the head. 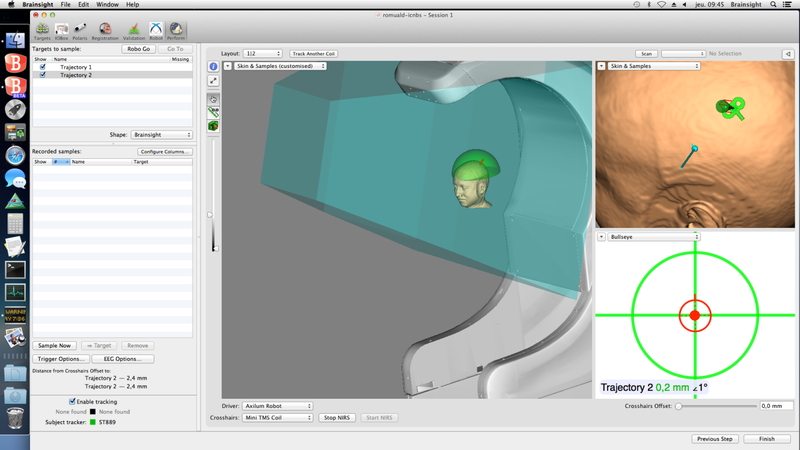 The patient head is located in the center of the work hemisphere by means of the computer-controlled seat. Each joint of the robot arm is equipped with mechanical hard stops to limit their movement amplitude. Thanks to the hemispherical architecture of the arm, the coil cannot draw a straight line when moving from one side of the head to another, but only move around that hemisphere. This prevents the coil or the robotic arm to hit the patient’s head during coil positioning. Moreover, the robot’s embedded software limits the force applied by the coil on the head in real time for a safe and comfortable session. Axilum Robotics TMS-Robot does not add a separate user interface. The operator can control the robot and define the desired movements and positions of the coil from the graphical user interface of a compatible neuronavigation system. The robot contains its own power supply unit, which is included in the hardware structure. The computer-controlled patient seat is reclinable and its height and depth can be set by a compatible neuronavigation system to adapt to the patient’s morphology. Axilum Robotics TMS-Robot fits to any space and enters into most elevators thanks to its practical dimensions and reasonable weight. It can be moved easily on its integrated wheels. You can get additional information from ressources below. 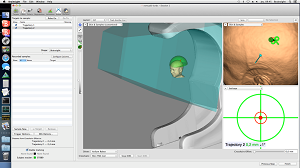 Learn the three steps to perform a TMS session with Axilum Robotics TMS-Robot. 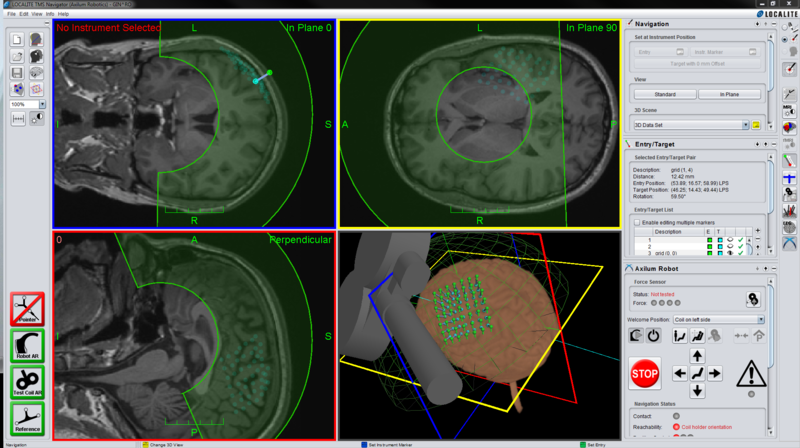 Check the compatibility of Axilum Robotics TMS-Robot with existing neuronavigation systems, TMS coils and stimulators, and EEG measurement devices. Check important regulatory information of Axilum Robotics TMS-Robot for your country of residence. Read publications of ICube about Axilum Robotics TMS-Robot. Download the brochure presenting Axilum Robotics TMS-Robot. Watch demos videos of Axilum Robotics TMS-Robot.